Home > Treating Hair Loss > Can Vitamin Supplements Prevent Hair Loss? A healthy diet full of fresh vegetables nutrient-packed fruits and lean proteins can aid your body in optimal function. Every function of your body, including hair growth, needs the right mix of vitamins, minerals, and fuels to carry out its job properly. Knowing this, many individuals who suffer from premature hair loss or thinning begin to wonder if nutritional supplements could help them deal with their hair problems. The hair follicles found in the skin of your scalp are responsible for the process of hair growth and shedding. Under optimal conditions the blood circulates through the body bringing needed energy, vitamins, minerals, and oxygen to the cells in the hair follicle. The cells use these substances to produce new hair, boost the follicles ability to hold onto existing hair, and signal follicles to release old hair to make room for new growth. If your system is lacking in one or more important nutrients, the cells in the hair follicle will be unable to perform their duties consistently or at full strength. For example, poor circulation, which can be caused by a lack of water or iron, can result in the hair follicles getting less blood and fewer nutrients than they actually need. In order to prevent a decrease in hair follicle function you need to ensure that your body is getting all of the healthy nutrition it needs on a daily basis. While this can usually be accomplished by consuming a diet rich in fruits, vegetables, and lean meats, some individuals may need to boost their nutritional intake with vitamin supplements. Can Nutritional Supplements Prevent Hair Loss? 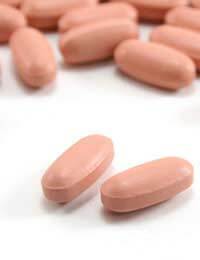 Vitamin supplements alone cannot prevent hair loss. They can, however, help increase the health of your body and improve the function of its various systems. While taking a multivitamin each day, along with enjoying a Healthy Diet, can improve your overall health, individuals who suffer from premature hair loss or thinning will want to increase their intake of the nutrients most important to the hair growth process. By choosing foods that promote good hair health and supplementing your diet with the vitamins and minerals known to support healthy hair, you can reduce the severity of your hair loss problem. Which Vitamin Supplements Boost Hair Health? Iron is very important to hair health since it aids in blood circulation. Good circulation ensures the optimal delivery of nutrients to the hair follicle. Without adequate levels of iron hair can become brittle, dry, and undernourished. The result is usually increased hair shedding and breakage of hair strands. To help ensure scalp health you can increase your iron levels by consuming more vegetables, like spinach, or you can begin taking an iron supplement. Copper is another mineral that is important for healthy hair. Copper helps strengthen your hair follicle in order to discourage premature hair loss or shedding. Copper can be found in whole milk and nuts, but you can also increase your levels by taking a copper supplement. The last important mineral needed for hair health is zinc. Low levels of zinc have been associated with premature hair loss. By increasing your intake of zinc, whether through the ingestion of whole grains or through a zinc supplement, you can help ward off increased hair shedding. To further boost your hair health efforts you will need to increase your intake of vitamin C, E, and B. Vitamin C promotes healthy capillaries, which boosts the blood supply to the hair follicle. Vitamin E promotes hair follicle health and increases hair growth. Finally, the vitamin B group helps promote hair's resiliency, colour, and strength. Since some vitamins and minerals can be dangerous at high levels, you should always check with your doctor before starting or increasing any nutritional supplement use. Talk To Your Doctor about your hair loss concerns so that he or she can recommend the right supplements and dosages for your specific hair problem, health status, and diet.